Nice!! 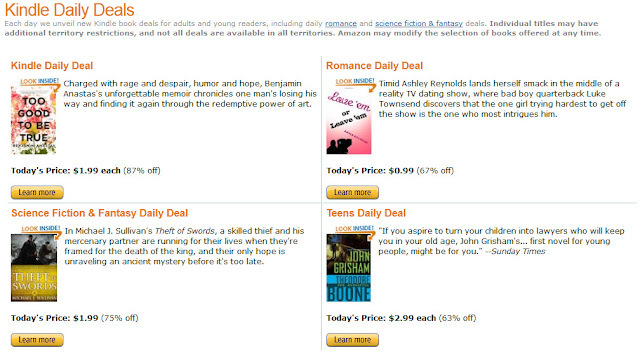 I think the deals of the day is a great way to spread the word about Riyria! For my part, I bought a couple copies as "stocking stuffers" and made sure my admittedly small world of Facebook and Twitter were made aware of it with my recommendation!!! I'm glad this deal was there. But a price of $1.99 was all the motivation I needed to take the plunge. I am so beyond pleased that it was available as a Kindle Daily Deal!!! I may not have found your books otherwise. I finished Heir of Novron just last night and I'm still processing. Absolutely totally and completely loved the whole series. You deserve so much more recognition!! I purchased it from Kindle Daily Deals and I'm glad I did it. It's an interesting world/book.